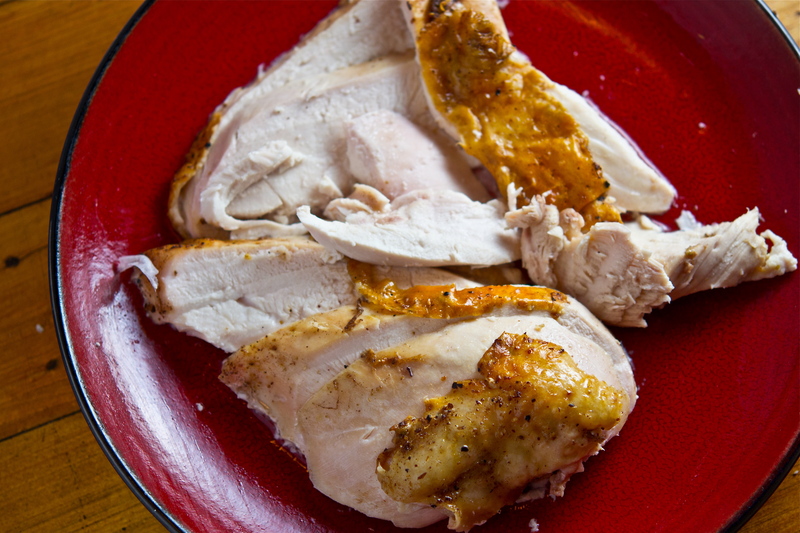 Prepare the chicken: Preheat oven to 400F – wash chicken (briefly) and pat very dry. Generously season the chicken inside and out with 2 to 3 tbsp of the Sichuan rub – feel free to be liberal with this (the roasting mellows out the salt); reserve the remaining rub. Stuff the bird with ginger, shallots, garlic and orange. Tie the legs together with kitchen twine, and tuck the wings in. Place bird breast-side down in a roasting pan. Brush 1 tablespoon of oil all over the top of the bird (which is the thigh side). Roast chicken breast-side down for 30 minutes. Carefully turn breast side up using two meat forks to flip. Brush breast side with oil, then continue roasting until thickest part of thigh reaches temperature of 175F and breast is 160F. Generally, this will take another 20 minutes for a 3 1/2 lb bird. If using larger bird, add 7 more minutes for every pound. Remove from oven and let rest for 10 to 15 minutes. Carve and serve with the reserved Sichuan Peppercorn rub on side for dipping.